The end of active combat, secured by the signing of an armistice on 11 November 1918, allowed a gradual refocusing of the national vision. With the insistent demands of the war front gone, energy could be redirected towards the needs of the post-war Australian community. Participation in the war had brought about irreversible social and economic change, which drove the next stage of the nation's history. 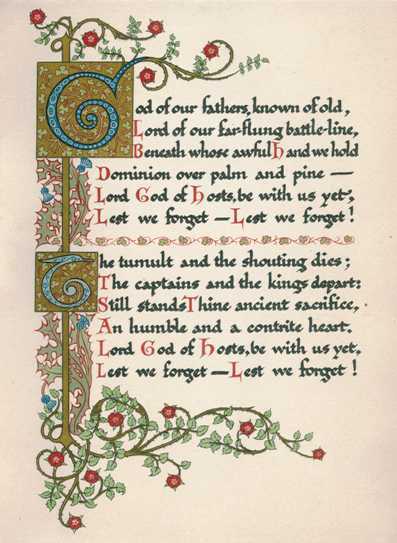 The atmosphere of profound relief and spontaneous celebration which erupted with the armistice was tempered with the knowledge that for many Australian families there would be no return of the men they had farewelled, and sobered by the realisation that, with hostilities in Europe over, the nation faced many fresh challenges – prime among it being the repatriation of servicemen. The Great War was formally brought to a close with the signing of the Treaty of Peace by Britain and its allies and Germany, at 4pm on 28 June 1919. Preparations for a grand celebration of peace were already underway by March when the Advisory Council of the Victory Celebrations announced its plans for commemorating the end of the war. Three days were to be set aside for "thanksgiving and rejoicing". While the central theme of the celebrations was to honour those who fought in the war, the committee was determined to include every area of the community in the events. The organisers were at pains to arrange a celebration that was felt to be appropriate – an occasion for celebration and rejoicing at the ending of the war but without any display of extravagance or "unnecessary expenditure" (Sydney Morning Herald, 14 March 1919, p.7, 8). Saturday 19 July was nominated as Peace Day to be observed throughout the Empire, and in Sydney this was preceded by a Thanksgiving Day on Sunday 6 July as well as a further Thanksgiving Day held the Sunday after Peace Day, and a Children's Day held on Friday 18 July. While thanksgiving services held inside churches went ahead on 6 July, open air services planned for the day were outlawed at the last minute due to concerns about the spread of influenza. However, in response to numerous requests for the ban to be lifted, open air services were held across the city and suburbs the day following Peace Day on 20 July. Local residents of Woollahra were able to attend three open air services held with the backing of council and conducted by local clergy. Services were held at Steyne Park in Double Bay where a crowd of over 500 people gathered and the State Military Band played, at Rose Bay in Lyne Park, and in the garden of the Council's Ocean Street chambers. 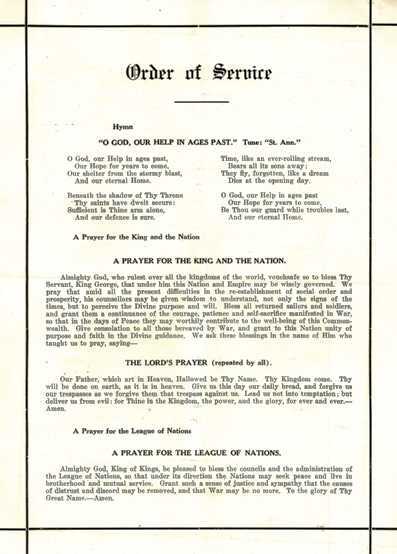 The Woollahra services closely followed the official program where the Royal Proclamation was read and the National Anthem sung "the same as at all the services at 3:30pm precisely" (Sydney Morning Herald, 21 July 1919, p.11). 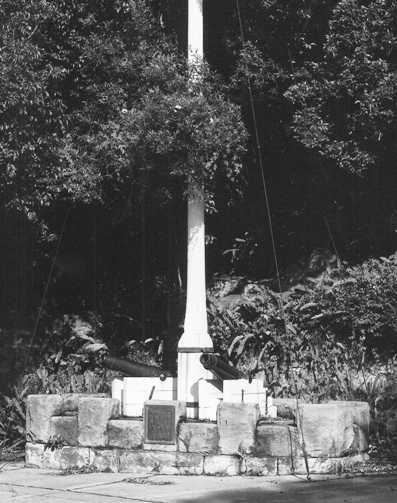 In Vaucluse, the first of the annual ceremonies at the recently unveiled memorial flagpole was held as a thanksgiving service for the official ending of the war. A children's picnic and sports day was held the day before the general Peace Day celebrations on Friday 18 July. While the "youngsters were not to be overwhelmed with speeches", a brief address written especially for children by the official war correspondent Charles Bean, was read to the children at each school (Sydney Morning Herald, 18 July 1919, p.9). One of the more exciting moments of the day was the presentation of a commemorative medal to every child. Following these official proceedings, the children then headed to their allotted park or sports ground to enjoy a picnic and an afternoon of organised sports and games. The children of Paddington had their picnic and sports day at the Sydney Sports Ground, the Council and citizens of Paddington having raised considerable funds to ensure the success of the day. Image of Paddington Children's Day from the 'Paddington Council Annual Report', 1919. 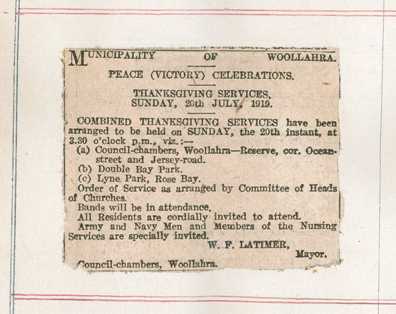 While Armistice Day on 11 November 1918 had seen a spontaneous outpouring of joyous celebration, the Peace Day festivities were a highly organised affair. 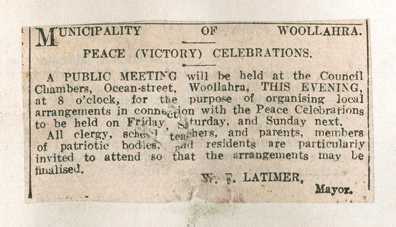 The Peace Day Committee planned a series of co-ordinated events to ensure "a crowded day and evening of joy" for the residents and visitors of Sydney. The day began with a flyover of the city followed by a march through the city streets of over 10,000 returned sailors and soldiers. The huge column of men was interspersed with 30 bands and the route lined with spectators, comforts funds, choral societies and bands. Businesses and buildings along the way were decorated with banners and bunting, while Macquarie Street, the 'Avenue of Allies', was flanked by triumphal arches and lined with the peace flag of the League of Nations. An appeal to car owners to come forward had seen enough cars donated for the day to carry the wounded returned soldiers and army nurses. Immediately after the military parade was a 'peace pageant' of women war workers. Then at 11:30am "all movement ceased in commemoration of the dead". 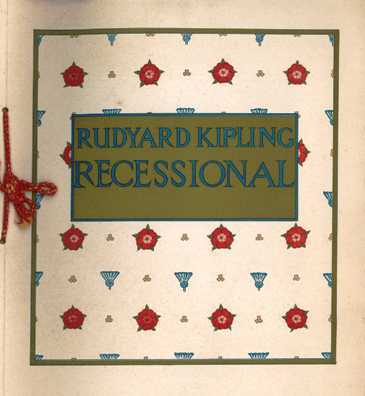 The bands played Rudyard Kipling's Recessional, bugles sounded the Last Post and three minutes silence was observed (Sydney Morning Herald, 21 July 1919, p.11). Captain Harold Lovejoy's copy of the Recessional. Capt Lovejoy was captured and held as a prisoner of war at Crefield in 1917. As a blunt reminder of the consequences of war, explosive fire crackers such as "bungers" and "throw downs" were banned from the celebrations due to the adverse effect it was feared the noise from these would have on those returned soldiers suffering from shell shock (Sydney Morning Herald, 8 July 1919, p.9). In the afternoon after the conclusion of the march, the entertainments included a regatta on the harbour, a naval and military tournament at the Show Ground, and various sporting matches (including Queensland v NSW) at the Cricket and Sports Grounds. In the evening, the city and harbour were lit by floodlights bathing "big blocks of buildings in a mass of gorgeous colouring". Illuminated were the 'Avenue of Allies', warships and the major buildings such as Customs House and the GPO. Bonfires were lit around the harbour – including fires at Nielsen Park, South Head and Lyne Park, warships performed a searchlight display and there was a fireworks display from Garden Island. The illumination attracted thousands of onlookers and the impression made was such that the "memories of a great city dazzling from end to end with bright lights will not quickly fade" (Sydney Morning Herald, 23 July 1919, p.12). Later that evening, the Stadium at Rushcutters Bay hosted a fund raising carnival with boxing exhibitions, skipping championships, highland dancing, and massed bands. Today we mark the end of the five cruel and bitter years which have passed since first our country drew the sword in defence of right ... But if, knowing now our strength, we are a stronger people, we are also a sadder people. Until this generation passes, the knowledge of the price we paid, the memory of the splendid young lives laid down so gallantly for our sake, the sight of the broken men who have come back to us – these must always temper our joy in our victory and our freedom. The nation's medical resources, already taxed from the impact of returning servicemen suffering long term medical problems, were further stretched by the outbreak of an influenza epidemic which had already decimated troops at the war front during the latter stages of the conflict. The inevitability of the virus reaching Australia was recognised in advance, and local councils were put on notice by the state health authorities to anticipate the problems which would arise, and the response that would be required of local government. 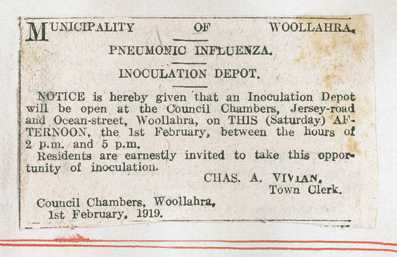 In response to the requests of the government, Woollahra Council opened an inoculation depot at the council chambers where over 2,500 people were inoculated free of charge. 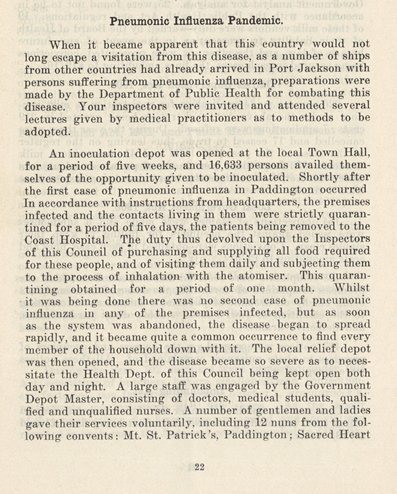 Similarly, Paddington Council provided rooms free of charge at the Town Hall for inoculation as well as for the "large staff of government assistants". A temporary nurses' hostel was also created at the behest of the government. The number of people inoculated at Paddington over a period of five weeks reached 16,633. 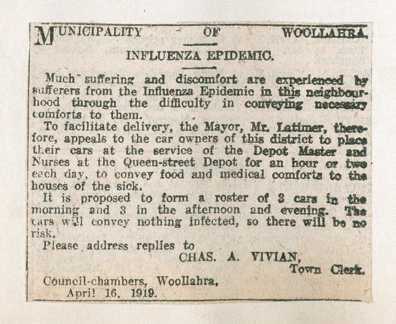 Further support to influenza sufferers was offered in Woollahra where a depot was established at the Congregational School Hall in Queen Street. The depot was staffed by nurses and volunteers from the local Red Cross Society with Dr Adams of Double Bay the medical officer in attendance. The mayor, Ald. William Latimer, reported in the 1919 annual report that over 3,000 meals were provided at the depot. The council placed on record its appreciation of the "self-sacrificing efforts of Mrs Stafford and her band of loyal assistants for their public spirit and devotion to the great work of the relief of the stricken". Recognising that the Vaucluse district would have less calls on its services than other more densely populated areas of Sydney, members of the Vaucluse branch of the Red Cross concentrated their efforts on assisting at the local inoculation depot, making daily rounds and supporting those in need in other communities such as providing clothing for poorer children and comforts for those quarantined on board the troop ship HMAT Argyllshire. The arrival of men back home from the front was surely the most impatiently awaited event of the immediate post-war period for both serviceman and families. But repatriation as a process involved much more than transporting and welcoming the returned men home. Resettling servicemen into routine life and secure livelihoods was slower and more problematic aspect of the exercise, and one for which local government accepted a partial responsibility. We mean by repatriation an organised effort on the part of the community to look after those who have suffered either from wounds or illness as the result of the war and who stand in need of such care and attention. We mean that there should be a sympathetic effort to reinstate in civil life all those who are capable of such reinstatement. The Repatriation Department was established to create and coordinate a scheme for repatriation. The department coordinated the provision of pensions for the disabled and for dependents of those who had died; the establishment of employment bureaus, and vocational and rehabilitation training for returned soldiers; and the provision of free hospital and medical care such as artificial limbs for amputees and care homes for the incapacitated. Leave pass from Randwick Military Hospital issued to Leo Whitby Robinson who lost his arm in the war, 1919. Despite the government run scheme, the work of voluntary groups in supporting returned soldiers - such as fund raising, endowments and practical assistance - was still of vital importance to the repatriation effort. 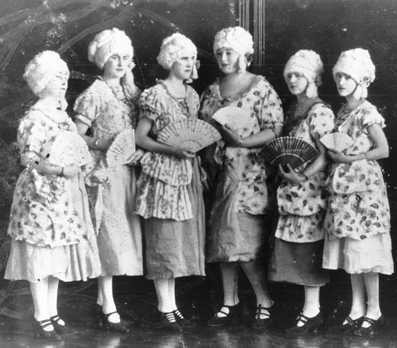 A group of Double Bay women in fancy dress at a party held to raise funds for returned soldiers, ca.1919. The government sought to provide employment for returned soldiers by enacting the Returned Soldiers and Sailors Employment Act in 1919 which gave soldiers preference and reinstatement in employment. 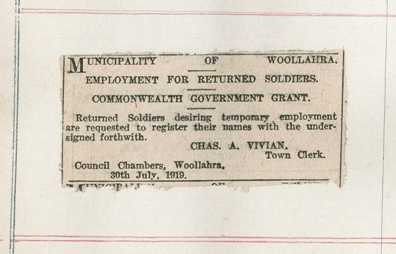 In its bid to help returned soldiers find work, the Repatriation Department enlisted the aid of local councils. 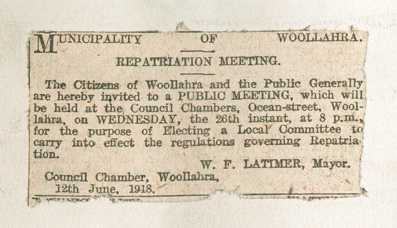 The appeal was greeted with enthusiastic support from Woollahra Council, representatives of which attended weekly meetings of the committees charged with investigating applications by ex-soldiers for assistance in "purchasing furniture, businesses, advances for various purposes, purchasing tools of trade and undergoing vocational training in various trades". The mayor proudly reported in the Council's annual report of 1919 that "great success has attended the efforts of the committees - almost without exception every application has been approved of, and the unemployed soldier is practically unknown in Woollahra". The Repatriation Department also provided subsidies to local councils to assist them in employing returned soldiers. Paddington Council received £600 for employing men on the 'Barrack Hill Reserve' where "railing and coping were removed, several trees taken out, the branches of others lopped, and the whole area levelled and turfed. Seats were also added, and the reserve made into a useful and ornamental one" (Paddington Annual Report, 1919). With many men returning home with little or no money other than their severance pay, schemes were introduced to assist returning soldiers with finding a place to live. The government introduced the Soldier's Settlement Scheme in 1916 and the War Service Homes Commission in 1918, while the Voluntary Workers Association was established as a volunteer program to build houses in 1916. While the soldier's settlement scheme was supporting resettlement in rural areas, there was still a need to find homes for returned soldiers in the suburbs. Towards the end of 1915, crown land in Frenchs Forest was set aside for a soldier's settlement and calls were made for volunteers to clear land and erect houses. The appeal was so successful that the Voluntary Workers Association was formed on 10 February 1916 with the aim of providing housing for returned wounded soldiers or the widows of soldiers. ...the best way to help disabled soldiers or widows who had nothing but a scanty pension was to make them in a sense independent and safe from the stings and arrows of misfortune. The Association aimed to find small blocks of land (preferably gifted to the Association) in Sydney suburbs or country towns, on which to build homes and, if the block was large enough, also make provision for poultry and fruit and vegetable growing. The completed home and small farm was presented to the eligible returned soldier who then repaid the interest and principal on the value of the house. 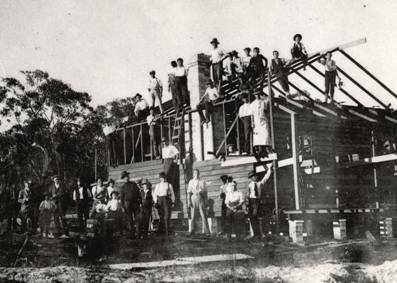 During the next two years, the various branches of the Voluntary Workers Association built over 30 houses on blocks of about 5 acres at Frenchs Forest. The Vaucluse branch of the Association was responsible for the building of one of the first homes at the settlement - a weatherboard cottage for Sgt Harold Buckley who had been sent home from Egypt in March 1915 with tuberculosis. Harold took up residence in his new house in mid-1916 and was reported in the press as one of the success stories of the new settlement (Sydney Morning Herald, 19 March 1919, p.6). 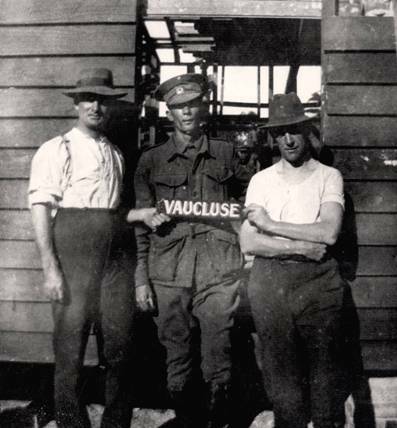 Harold Buckley with two members of the Vaucluse branch of the Voluntary Workers Association, Frenchs Forest, 1916. By 1917, there were 67 volunteer branches of the worker's association based chiefly in Sydney, and the volunteers included both men and women. 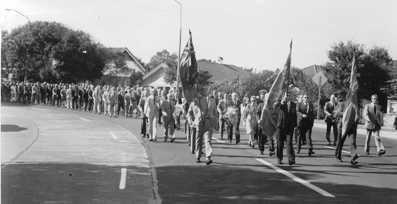 By the time of the Peace celebrations in July 1919, the association had erected almost 300 homes across Sydney. By the close of the war, the government recognised the need to do more to assist returning soldiers with finding affordable homes. To help those resettling closer to the city, the War Service Homes Act 1918 was created, coming into effect in March 1919. Under the Act, eligible returned soldiers and their female dependants were able to receive an advance in order to build their own home. An agreement with the Commonwealth Bank gave the bank the authority to effectively conduct the scheme under which returned soldiers could apply to borrow a set sum in order to purchase land, build a home and make repayments on easy terms. 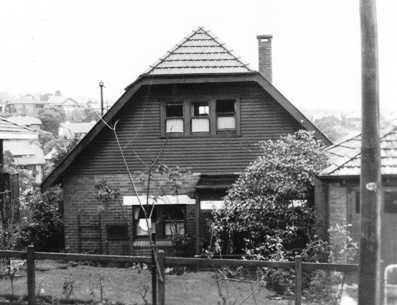 The first home was built in Belmore and the foundation stone of the cottage was laid by the governor of the Commonwealth Bank, Denison Miller. Once completed, the house would consist of "four rooms and kitchen" and be "replete with modern conveniences, such as gas stove, bath, lavatory, and verandahs'" (Sydney Morning Herald, 22 July 1919, p.8). Plans for the homes were prepared by the official architects for the scheme, Messrs. J. and H. Kirkpatrick. John Kirkpatrick was a well known architect of the day who lived at Logan Brae overlooking Cooper Park, and a cousin of the governor of the Commonwealth Bank. John Kirkpatrick and his eldest son Herwald designed over 1700 houses for the war service home scheme in its first 3 years. In October 1919, an advertisement calling for tenders for war service homes and the "erection of brick cottage residences" listed a number of Sydney suburbs including Vaucluse, Woollahra and Double Bay (Sydney Morning Herald, 1 October 1919, p.9). 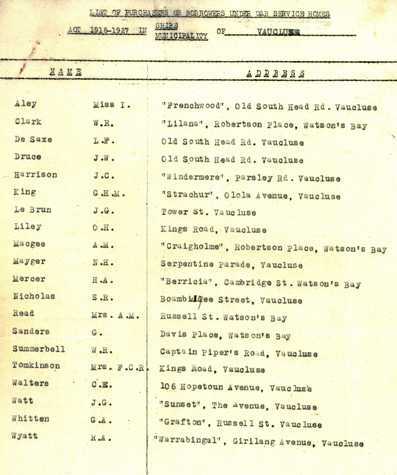 A list of war service homes in Vaucluse indicates that by 1927 there were 27 such homes in the district. 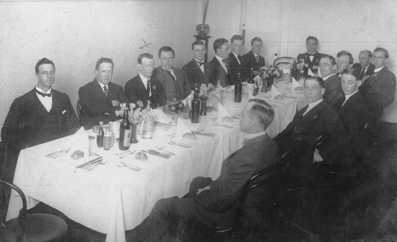 A group of returned soldiers at a reunion dinner (Private collection). The need for companionship and the unity of shared experiences continued to be important for many men and women after the end of the war. Various returned soldier's groups were established, often close knit groups based on the unit the soldier had fought in. 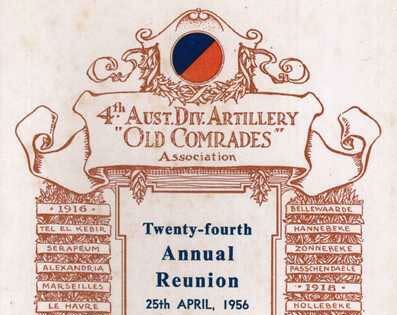 Leo Whitby Robinson's memento from the 24th annual reunion of his AIF division, the 4th Australian Artillery Division. It was recognised that a national support group for the welfare of returned soldiers should be created and in June 1916 the Returned Sailors and Soldiers Imperial League of Australia was founded. The League (later the Returned & Services League) became a strong mechanism for supporting returned soldiers - particularly in securing preferential employment and in fighting to secure pensions for those injured in war. State branches were formed – NSW in 1917 with sub-branches following, including the local branches of Rose Bay and Paddington-Woollahra. Other organisations concerned with the welfare of returned soldiers were also initiated, such as the Limbless and Maimed Soldiers Association formed in 1919. In 1926, a proposal was put forward by the Association to create an aquatic club as it was felt "the best manner for limbless men, especially those with leg amputations - and there were 550 with that disability in the association - to exercise themselves was to engage in water sport, such as swimming or water polo. It was also felt there should be some place where limbless returned men could go at week-ends or whenever they had a few hours to spare. Most limbless men would not patronise public baths and so parade their disabilities" (Sydney Morning Herald, 3 August 1926, p.10). By the middle of the following year, a special committee had secured a site with harbour frontage in Vaucluse and work began on building baths and a club house. The property, at 68 Wentworth Road, already held a two storey home which was adapted and furnished for its new purpose by the association. The Aquatic Club was officially opened on 25 April 1928 by the Governor, Sir Dudley de Chair. 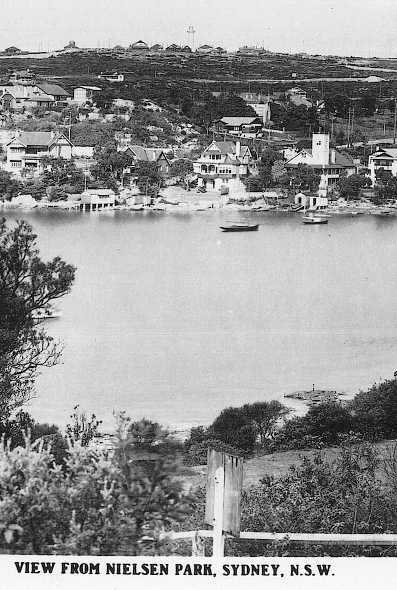 Site chosen for the Aquatic Club on Vaucluse Bay (the waterfront property to the left of the house with the tower); from a postcard, ca 1920. By 1931, the club was equipped with swimming baths, a boat shed with three rowing boats, a motor boat, an out board motor boat and a sailing skiff, a bowling green, and "in the basement … a sumptuously fitted billiard-room" (Sydney Morning Herald, 23 February 1931, p.11). 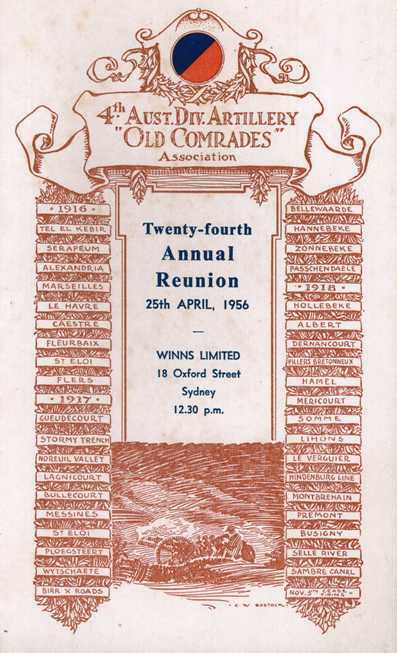 The 1200 members participated in swimming carnivals, an annual regatta at Watsons Bay, picnics and other social and fundraising events such as card evenings and dances. Carrying on the practice of raising loans to finance the war, the government generated three peace loans from 1919 to not only continue to finance the war but to also help fund the repatriation program. 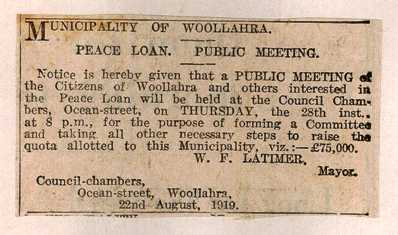 Woollahra's quota for its share of the first peace loan was set at £75,000 and a public meeting was called by the mayor, Ald. William Latimer, in August 1919 to make the necessary arrangements. Ald. Latimer was able to declare in the municipality's annual report for 1919 that the quota had been over-subscribed, with £135,000 raised by its residents. In recognition of this achievement, the Government presented the citizens of the municipality with a brass honour tablet which was placed in council's Ocean Street chambers. The need to honour the fallen, express gratitude to the serviceman, and acknowledge the sacrifice of the bereaved was met with the erection of monuments dedicated to a perpetual remembrance of the war – "Lest we forget". The districts of Woollahra, Vaucluse and Paddington were part of a nationwide movement which saw war memorials installed in townships, suburbs and city centres across Australia.